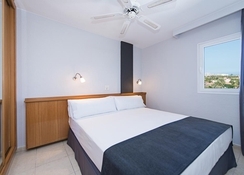 Just a short walk away from the Maspalomas sand dunes is AxelBeach Maspalomas – Apartments & Lounge Club, a gay-friendly establishment which also warmly welcomes straight couples. This adult-only complex is located in Playa del Inglés and features a range of leisure options designed to make your stay pleasant and fun-filled. Spread over four floors, the hotel offers 92 plush apartments with separate living areas, kitchenettes and en-suite bathrooms. A haven for party lovers, AxelBeach Maspalomas puts together some of the best parties and shows in town. 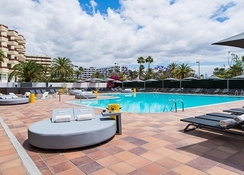 It also enjoys a fantastic location in Maspalomas, with a clutch of fantastic restaurants, bars and shopping malls all within walking distance from the establishment. Relax and refresh at the hotel’s wellness centre, which features a state-of-the-art gym, Jacuzzi and Hammam to rejuvenate yourself. The swimming pool and the Sky Bar are two of the highlights of the hotel, where you can meet like-minded people and enjoy delicious cocktails. If you’re looking for relaxation, the verdant Lounge Garden featuring Hawaiian hammocks is the best place to unwind. The hotel enjoys a strategic location in the centre of Maspalomas in Playa del Ingles. The beach is just a kilometre from the hotel and can be accessed on foot. It is surrounded by several shopping centres, including the famous Yumbo shopping mall and some of the happening bars and nightclubs of the region. The main bus stop of the area is 100 metres away and the nearest airport is Gran Canaria airport, at 30.6km from the property. 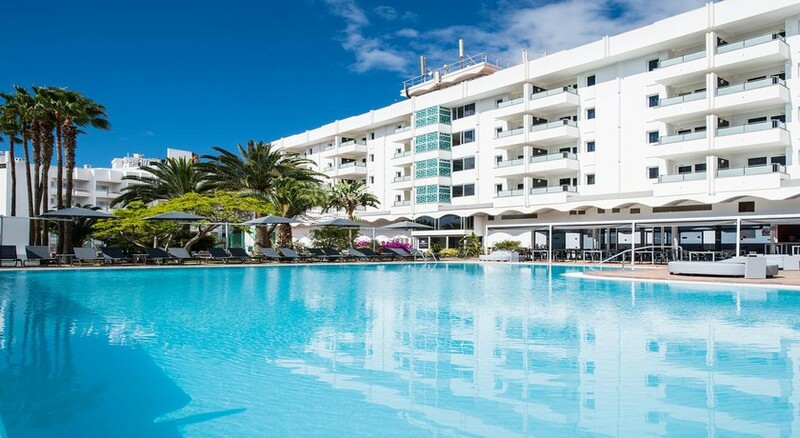 AxelBeach Maspalomas features 92 stunning apartments with spectacular views of either the main busy street or the hotel’s pool and gardens. 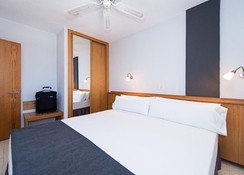 The bright, well-appointed rooms come with air conditioning, en-suite bathrooms, fully functional kitchenettes, separate living areas and terrace. The kitchens come equipped with microwave, fridge, kettle, toaster, coffee maker and much more. Guests are also provided with high-speed Wi-Fi facilities, in-room safe, mini bar and satellite television. Rustle up a scrumptious meal in your own kitchen or grab a quick bite at a nearby restaurant. Some of the highly-rated restaurants of the area include La Pergola for delectable tapas platters, Allende 22 Grados for excellent seafood and steak and Restaurante Donosti for authentic Basque cuisine. The Sky Bar is the perfect choice for enjoying a cocktail with groovy music and hip DJs, all of which accentuate the cosmopolitan ambience of the hotel. 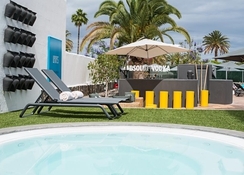 The swimming pool, the sauna and the bar are three of the highlights here at AxelBeach Maspalomas. Spend a relaxing afternoon chilling at the pool, sipping a delicious cocktail or enjoying snacks prepared by the Pool Bar. Shake a leg at the Sky Bar, where international DJs play the latest tracks. The wellness centre of the hotel has a gym, a Jacuzzi and a Hamman, perfect for releasing toxins and getting fit. The garden area of the hotel has Hawaiian-style hammocks, where you can relax, read a book and recharge your batteries for the night ahead.